Picton Historical Society Visit to Brayshaw Park in 1986. 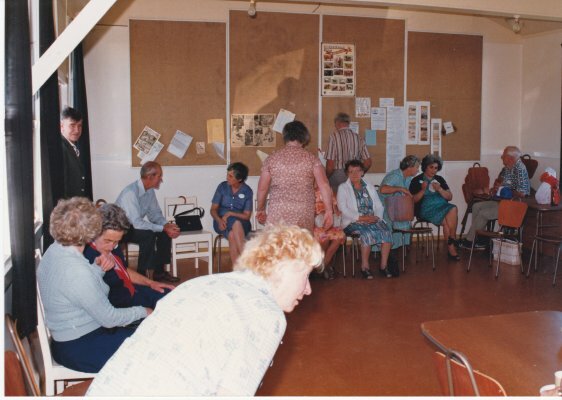 Description "Afternoon tea - Beavertown hall (Picton Historical Society Visit)", in 1986. The visitors supplied their own afternoon tea, using the Hall as a place to sit and relax. 30 or 40 members of the Picton Historical Society were to visit Brayshaw Park on 8 March 1986. Members of the Marlborough Historical Society would show them around [source: MHS minute book 6, page 133, 17 February 1986]. Part of the Brayshaw Park, Beavertown photographic inventory, taken by Roger Thwaites in 1986.